Taiko Kai, meaning "taiko club," was founded in February 2013 by UW students Kim, Kellie, and Jaymi Matsudaira. Through the club, they wished to introduce taiko, Japanese drumming, to UW. Led by students, the club teaches individuals how to play taiko and performs at various on- and off-campus events. What started with only a handful of people interested in learning has grown into about 30 regularly attending members each year, many of which had no music experience prior to joining. Though taiko is an uncommon art form in Western society, it is powerful because it appeals to people all backgrounds. Taiko Kai seeks to share their love of taiko with audiences, sharing Japanese culture with UW and the greater Seattle community. Though taiko is from Japan, the North American style of playing is significantly different from traditional styles. It is a relatively new art form since taiko was brought to America in the 1960s by grandmaster Seiichi Tanaka. 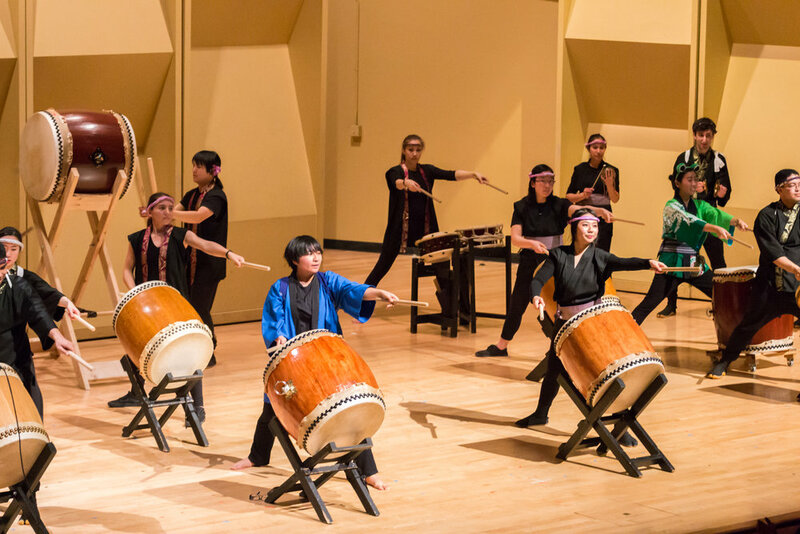 In this way, Taiko Kai feels a connection to the origins of taiko while contributing to what North American taiko, and even Pacific Northwest taiko, are becoming. Taiko styles in North America have the freedom to draw inspiration from anything like Japanese folktales to hip hop, leaving something new to always be discovered. Taiko Kai considers CulturalFest to be the most formal performance they have done. We see it as a great opportunity for newer members to experience performing in a more formal setting, since most of our performances are more casual. CulturalFest is also a way in which we share our art with the UW community. People recognize us at other campus events because they saw us at CulturalFest, and some even feel inspired to join our group afterward. It is so amazing to see our art reach others, especially on such a big campus like UW. This year, we are including all performers in all of our songs to show the power and energy of a kumi daiko (group drumming) ensemble. Though taiko drumming is a musical art, it is also highly visual. Many of our songs involve choreography like arm movements and bachi (drumstick) twirls. Some rhythms may be simple but are made complicated to perform because of choreography. In experiencing taiko audibly, visually, and sometimes physically, audiences will be blown away by the power of the art form. Learn more about Taiko Kai on Facebook, and come see their performance on February 2!